What are some of the features of the new app? You can choose between either of our two streams, WVIK or APRIS, and jump back and forth between them any time. Once you've selected a station, you can stream what is currently on the air. See the "Play" button at the bottom of the screen, with listing of program title. You can "Pause" this audio for up to 10 minutes and when you re-start by pressing "Play", you'll resume where you left off. To listen while you're on another app on your device, simply press your device's "Home" key to go to that other app. Many of our music programs (including those produced here at WVIK) will display the current piece at the top of the screen, while you're live streaming that program. 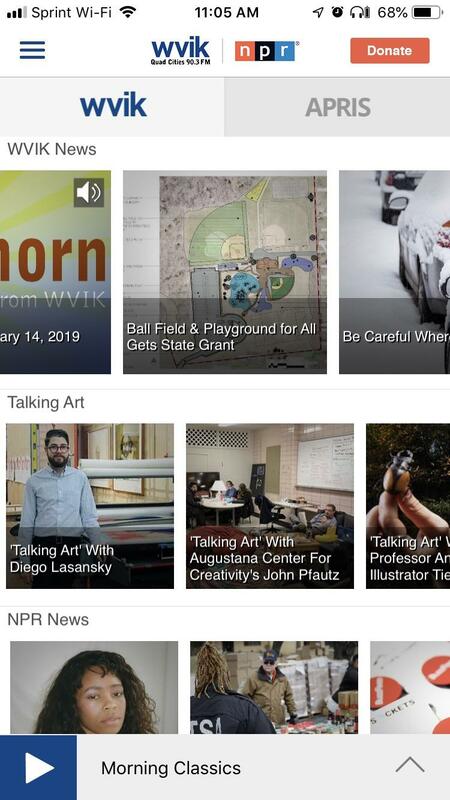 You can also find past local and national news/talk segments or programs listed under a variety of categories such as "WVIK News" or "Talking Art".